If you are going to give an award, put together a group of real people, make up a criteria you can openly share with everyone, select the winners and announce the awards. Don’t just put up a silly survey with hundreds of possible categories and self-nominated awardee choices. Most people who go there will not know why and what they are voting for, with the exception of, my friend or boss or colleague asked me to do this. This is flawed. 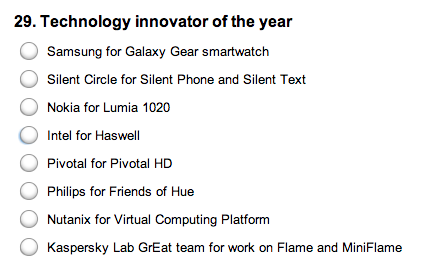 I saw this tweet from Pivotal asking us to vote for them for the “Technology Innovator of the Year”. First of all, I don’t know who is running this awards survey. It just said “V3 Awards Survey”. A bit of googling and I find this. V3 launched its fourth annual Technology Awards on Thursday evening with an event in Mayfair for winners from previous years, and 2013 contenders. The night saw the unveiling of this year’s categories, and attendees were able to nominate themselves or others during the evening. But don’t worry if you weren’t able to make it along, as there is still plenty of time to get your firm’s entries in. So anyone can nominate themselves in any category they want? This explains why the entries made no sense to me. Now voting for Pivotal, I don’t even know what they innovated frankly. I am not saying that they haven’t, I just don’t know how to vote for them versus the other shortlisted options in that category like Nokia for Lumia 1020, Samsung for Galaxy Gear Smartwatch, etc. This list just doesn’t make sense. Coming to Pivotal again, I really don’t know what they have innovated so far. Cobbling together a bunch of assets that existed previously into a new company is hardly innovation. Pretty much everything listed in the products page on Pivotal are pre-existing products under VMWare/EMC: Spring, RabbitMQ, vFabric, tc Server, Pivotal Analytics (was Cetas, acquired by VMWare), Cloud Foundry, Greenplum, GemFire, the list goes on. I do see one small piece of potential innovation that is new in this mix, HAWQ, as part of Pivotal HD, the Hadoop distribution offered by Pivotal. Is that why I should nominate Pivotal for the technology innovator of the year and not Kaspersky Lab GrEat team for work on Flame and MiniFlame? Now, don’t get me stated on that, I have no idea what Flame and MiniFlame are, and I am not going to google them now. And no, I am not going to propagate this by publishing the survey link. There now, I got things off my chest. Feels better. I just need my 5 minutes back.